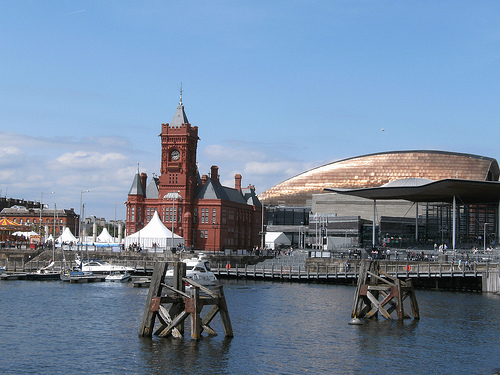 Cardiff has changed dramatically in recent years to become the true capital city of Wales. The city centre is filled with attractions and entertainments for the whole family and no matter what your personal tastes and preferences you will find something to do that will tick all of the boxes for you. Within the city and the surrounding area you will find a wide range of activities from adrenalin fuelled abseiling to relaxed whiskey tasting. Cardiff has become a city that attracts people to it from all over the world, some come to see the magnificent castles, others for the historic houses and yet more for the wildlife to be found here or the range of water based activities that they can enjoy. Cardiff bay is now home to the studios of BBC Wales and the city is used for the location shots in several television series like Dr Who, Upstairs Downstairs and Casualty. This summer visitors will be able to take part in a new and exciting experience that the studios are involved in; the Dr Who Experience is due to open in July 2012 and offers visitors a fabulous multisensory experience where they can get involved in exclusive filming involving the Doctor himself and be amazed by the special effects that will take them on an incredible journey through space and time. The filming of television favourites like Dr Who and Torchwood have done much for the popularity of the city, with many fans wanting to visit some of the incredible locations that have been used throughout the series. In 2009 the city of Cardiff was designated as a City for Sport, and its current reputation for the standard of sporting events that it hosts is second to none. There are stadiums for all kinds of sports from Rugby to Athletics, and the city boasts an International Sports Village which offers visitors the use of a superb Olympic sized swimming pool, and state of the art ice rink. Whether you are looking to enjoy the spectacle of a title match or take part in some of the activities yourself, there are plenty of opportunities to work up a sweat on the sporting field of your choice. Cardiff also boasts an Olympic standard canoe slalom run at the Cardiff International White Water Centre. Whatever your chosen sport from the adrenalin packed to the sedate, Cardiff has sports for all. Cardiff offers lots of options in the way of family entertainments. There are many theatres that offer regular performances of ballet, opera and fun musicals, as well as many venues offering regular live music and world class performers. There is also a wide choice of venues at which you can enjoy the performances in the city, from cosy venues catering for a select few to modern areas that can seat thousands of people at a time, there really is something here to suit everyone’s tastes. If you have never been to Cardiff before and are unsure about where to start or what to see first take advantage of one of the guided tours that are on offer. With a knowledgeable guide leading your tour you can be sure that you will see all of the things that you came here for, without having to spend time wandering around not knowing where to go next. Not only will you be taken to the sites your guide will also be able to tell you about the history and any local legends that abound in the area. There are a variety of different tours that you can embark on, including everything from the typical daytime sightseeing tour of the city’s landmarks and iconic buildings, to wildlife tours where you can meet some of the furrier locals to night time ghost walks that will introduce you to a very different side of the city. There are not that many places where you can be sure that the entire family are going to be entertained but Cardiff is one of them, from its ancient castles to its modern television studios there are a wealth of attractions for you and your family to enjoy.